Our LATEST Strategy for Beating Roulette! ‘V3’ stands for ‘Version 3’, this is our third Roulette System. Use with ANY currency including GBP, USD and Euros Works with all Roulette games, including Online, Live Dealer & Land-Based! We’ve Overcome 2 Major Problems! 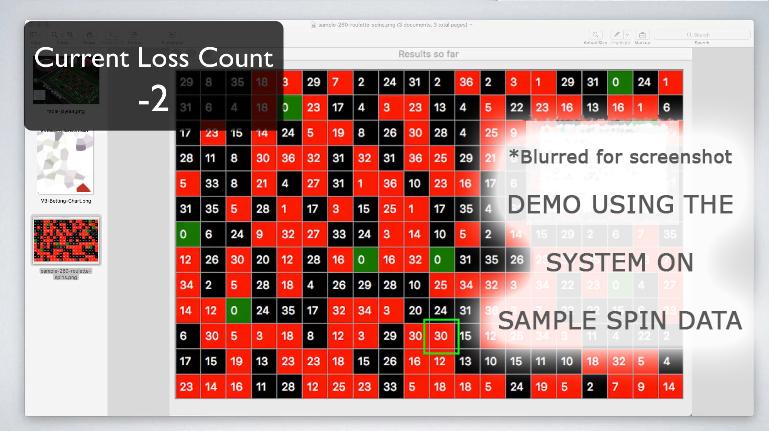 The first major problem with Roulette is you can get BAD STREAKS. This is a problem when playing the game, that most systems can’t get past. You know the feeling: Everything is going great, you’re winning, it’s going well, and then suddenly – a LONG run of losing numbers appears! If you’re betting on RED numbers, 7, 8 or 9 BLACK numbers in a ROW suddenly appears! With most systems or strategies this will WIPE YOU OUT. The second major problem is TABLE LIMITS. Table Limits are the casinos way to MAKE SURE you cannot use a progressive betting system (like the Martingale system) to consistently win. For example, many systems out there invovle a variation of doubling your bet after a loss, so you eventually win back all losses and make a profit. And this WOULD WORK if you had unlimited funds available AND if the casino didn’t have table limits. But they DO have limits, so these ‘double when you lose or win’ systems cannot work. OUR V3 ROULETTE SYSTEM AVOIDS BOTH OF THESE PROBLEMS! 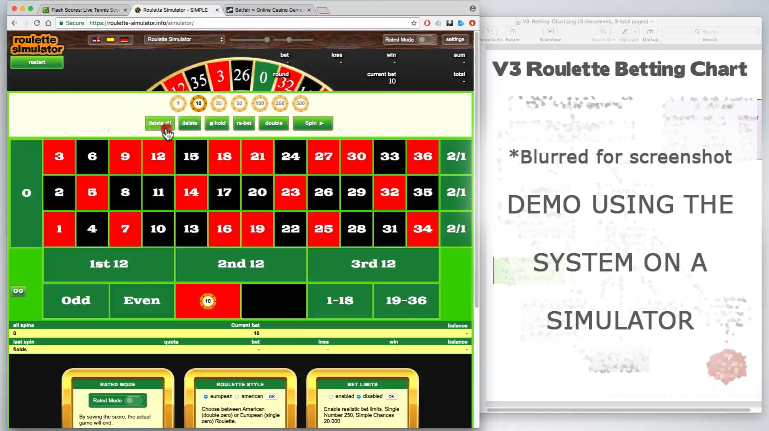 We already have 2 roulette systems, but this new V3 System uses a different strategy. This system is more advanced, and does NOT use Flat Betting. It also does NOT use any kind of ‘double your bet when you lose’ strategy. This system is for anyone that wants to make money from Roulette. Play virtually anywhere – Online, RNG, Live Dealer, Offline, Land-Based – All good! You should get this system because it’s LOW risk, makes easy £5.00 wins regularly, has a very low starting bankroll requirement, and comes with over 1 HOUR of video explanations. We’ve tested this system for months and it’s produced profits on all versions we tested. We’ve called this system V3 because it’s our 3rd Roulette System (version 3). We now have 3 separate Roulette Systems, and each one is very different. 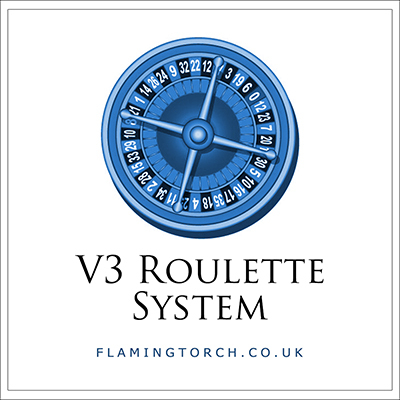 This new V3 Roulette System is our most advanced and current system to date. It can win £5.00 profit in just a few MINUTES. You can play on almost any Roulette table either online or in the real world, and it’s low risk with great long term potential. This system works by betting in Sessions. You only bet on outside bets (1:1 or even money bets like Red, Black, Odd, Even, High or Low). You follow our specially designed Betting Chart to place a small bet at the start of a new game, before the wheel spins. After each spin of the wheel, what action we take next depends on how much we won or lost on that spin. This is not a flat betting system. We vary the bet based on how far behind break even we are. We NEVER double or increase the bet after a losing spin. This protects your bankroll from heavy losses during a losing streak. (We also do not just double or increase bets after a winning spin either, it varies, and exactly what you bet is explained in the system). At the end of a session you will have won £5.00, or hit the stop-loss of -£50.00. Winning sessions are VERY LIKELY to happen, and losing sessions are unlikely. The strategy we teach in the system means you limit losses when the occur and capitalise on wins. You can play Roulette any time of the day or night, online or at a real casino. This system teaches you to play using ‘points’. 1 point = £1.00 to keep things simple. If playing online: You should play at a casino that allows SMALL bets on outside (even money) bets (ie. £1.00 bets on Red/Black). Some require a minimum £5.00 bet. Betfair are OK because they ALLOW small outside bets on both RNG and Live Dealer Roulette. Other online casinos that we believe ALLOW small outside bets: Betfair, William Hill, Sky Vegas, PaddyPower, Mr Green, Bet Victor, Ladbrokes and Virgin Games. There’s probably many more! Things change from time to time so it’s up to you to find and use a casino that allows small outside bets. NOTE: This system is NOT based on our other Roulette Systems – this is low risk and cannot have big losses in a session. To some people, £5.00 wins doesn’t sound like much. BUT – you can have LOTS of them, whenever you want, with very little risk! We are only betting small amounts! We do this to ensure VERY LITTLE RISK to our bankroll. We’d rather have something that works, and makes lots of small amounts, than something that doesn’t. It’s possible to win £300.00 in a month – if you just win £10 a DAY! (two sessions a day). If you did that you would win £3,600 A YEAR – in as little as 10 minutes each day. Let’s assume you don’t want to play every day, and you don’t want to play for long. So let’s say you just play 5 days a week and only aim for ONE SINGLE WINNING SESSION per day. That would still equate to £100 per month (£1,200 per year!!) – and that’s hardly using it! THIS SYSTEM IS A NO-BRAINER! You can start with just £100.00 GBP (or whatever your currency is USD, EUR, AUS). With THIS system a large bankroll is not needed because we’re only placing SMALL bets each time, and our session target and stop loss are low. With £100 in the bank, we’d be aiming for £5.00 profit from each winning session. None of the above are a problem with this V3 Roulette System. By only placing small bets we avoid big losses. 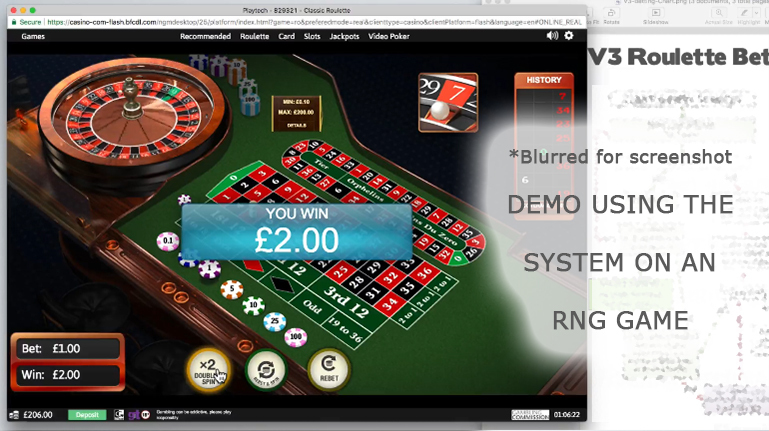 Using this V3 System we made good profits playing Roulette online and offline. We have tested online RNG Roulette games, Live Dealer Roulette games and played for real using our own in-house Roulette Wheel used for testing. Spread over a period of 3 months, we played as many sessions as possible using all 3 versions of Roulette. Some days we wouldn’t do any testing, but on others we’d spend many hours playing many sessions in a day. Overall it averaged out at around 3 sessions played for each method per day. All sessions were played as per the V3 system. NOTE: IN THE MANUAL WE EXPLAIN HOW MUCH WE PLAYED, HOW LONG FOR AND WHAT THE RESULTS WERE. All 3 videos are in FULL HD 1080p, below are some scaled-down screenshots of us using the system. NOTE: The videos resolution (size) are much LARGER than these small screenshots. 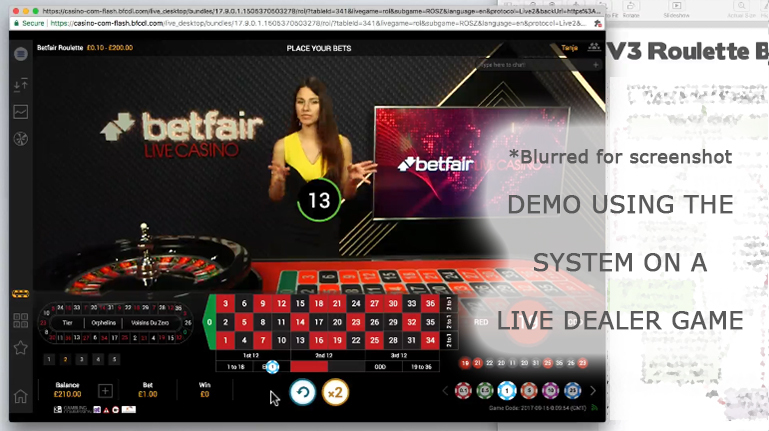 In the videos you will see us explaining and demonstrating the system for real, using the above Roulette games. It’s important to show a variety of different Roulette games so you know it’s not just one particular version of the game you have to play. Is this system similar to your other Roulette Systems? NO, this system (strategy) is completely different to our previous Roulette Systems. Could I get banned from the casino if I keep winning? NO, you’re only winning small amounts which will not attract attention or get recognised by online casino software. You’re not doing anything wrong. Do I HAVE to use Betfair if playing online? NO, you can use any online casino that offers low stakes Roulette. Other than Betfair you could use William Hill, Paddy Power, Ladbrokes, Sky Vegas, Bet Victor, Mr Green, Virgin Games and many others. Things change from time to time so it’s up to you to find and use a casino that allows small bets (low stakes) on outside bets. A copy of this betting system and a bankroll. Could I use the system to play Roulette at a real casino (land-based)? YES. You would just need to memorise the Betting Chart. I am not in the UK, can I use this system in the USA or outside the UK? YES, this is not a UK-specific system. You can play online or at a real land-based casino anywhere in the world. Try and play on a single-zero wheel (european style) if possible and find a low stakes table that allows low stakes on outside bets. A minimum of £100. Anything over that is also fine. £200 is recommended. How much will I have to stake for each bet? You will be betting between 1 to 7 points per spin. (if you decide £1.00 is equal to 1 point, then this would mean betting between £1.00 and £7.00 max per spin). What exactly will I be betting on? You will be betting on outside bets only. These are also called 1:1 bets, or even money bets. Examples of these are RED, BLACK, ODD, EVEN, HIGH or LOW. Using this V3 strategy to adjust your bet amount during a session means you will have lots of easy winning sessions. Any Casino. Online or land-based. Can also be used on FOBT’s and automatic roulette machines. No. This system (strategy) is unique to FlamingTorch. Bankroll – You must have at least 100 chips to start. I used to think Roulette was unbeatable, but now I realise I just wasn’t playing any kind of system or strategy. Using the V3 Roulette System has turned Roulette into a profitable game for me to play. And it’s quite easy to do. I only play online and using the V3 Roulette System I can win very quick small sessions making a profit of £5 or more. I do this over and over again until I’ve made £25 to £50 and then I quit for the day and do other things. I’ve had the system for about 3 weeks now and not even had a single losing session. THIS IS UNHEARD OF – to not even have a losing session in 3 weeks of playing? Maybe i’m overdue one, but for now this system has made me over £500 profit, so I highly recommend it. ★★★★★ Best Roulette System Ever! I love this Roulette system, thank you so much for creating it. The very first time I tried it out, I played a few sessions, won them all and made over £25.00. This only took me about 15 minutes to do, and it was REALLY EASY. Then next time I used it, I played for about 1 hour and won over £60.00. It’s already paid for itself and I can see this working for a very long time. I live near a land-based casino and will be trying the system out on a real wheel next week too, so I have the choice to play online or at a real casino. Thanks again I love this system. I consider myself pretty clued up when it comes to betting systems. I’ve tried many of them, and most of the time they don’t work out for me. I took a chance on the V3 System because I liked the look of it and I know FlamingTorch are one of the better vendors out there. Being completely honest, this system worked for me the first time I used it. And the second time, and many times after until I had a losing session about 15 sessions in. I lost about 8 sessions worth of profits, so obviously i’m still well ahead and in profit. If the system continues to perform like this, I can say it’s a good system and I do recommend it – because it’s profitable. That’s all I care about really – profits. And so far from my experience, it works and I will continue using it. NEED A LOW RISK ROULETTE SYSTEM THAT MAKES REGULAR PROFITS CONSISTENTLY? DOWNLOAD IT NOW! 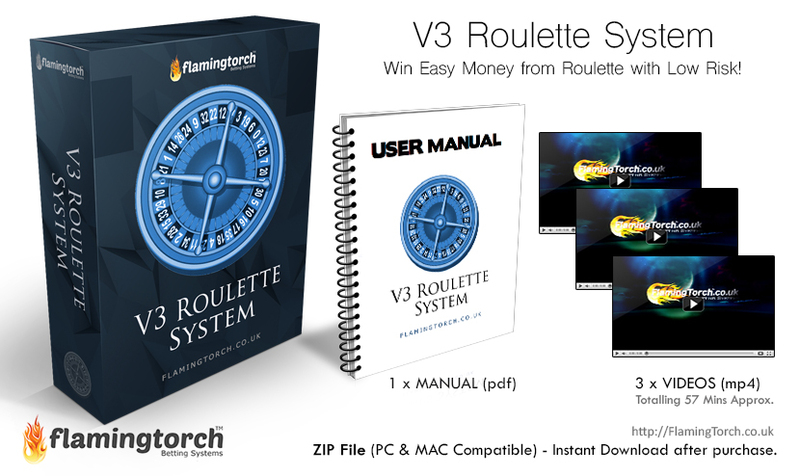 Download your copy of our V3 Roulette System today and DISCOVER how to play ROULETTE a better way with our easy to follow Instructional Videos & Manual. Click the Add to Cart button below.